Crafts, like most art, often reflect the lives and values of the people who create them. 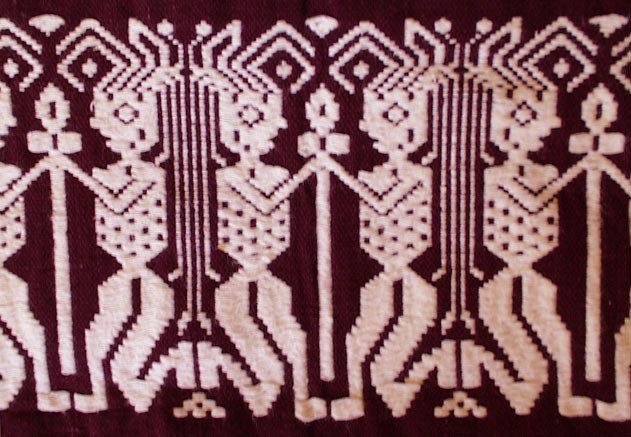 What do the crafts below tell you about the people who made them? What do they tell you about where these people live? Why do you think they chose the materials they did? 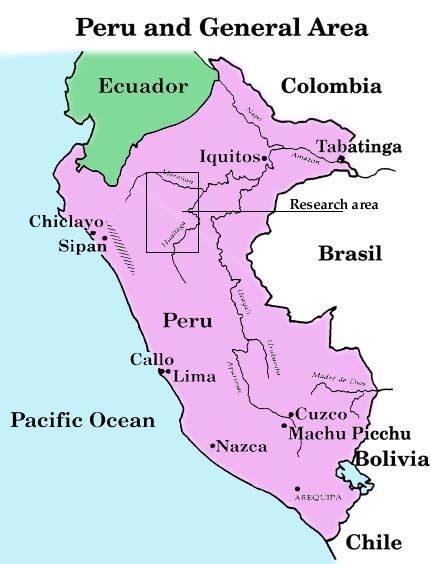 Many people in Peru are skilled artisans who produce a variety of items. The crafts shown on this page were bought as souvenirs from a market and reflect the lives of the people living in southern high country. For many rural Peruvians though, these are useful items. Remember: You can click on any image to see it larger and in more detail. This woven cloth could be used as a bedspread, wall covering, or tablecloth. Do you think it is used for every day activities or for special occasions? 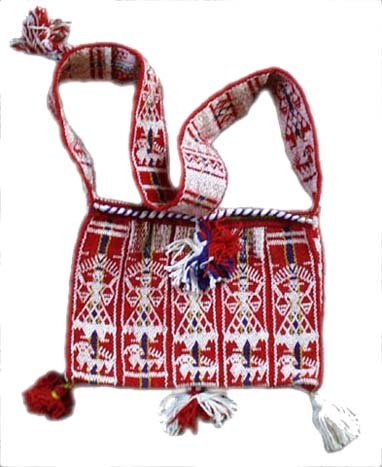 Bags are handy items for both men and women to carry items. Look at the detail of both the bag and the cloth above. Compare and contrast the design on the two items. This colorful woolen hat is worn only by unmarried girls. Once they are married they wear a "bowl" hat. This wool isn't from sheep, though. What animal do you think was used? Which colors are natural, and which ones were probably dyed? The detail on this hat is from the bottom portion of a knit hat worn by the country-dwellers or campesinos and is called a chullo. Why would this hat keep you warmer than the one above? 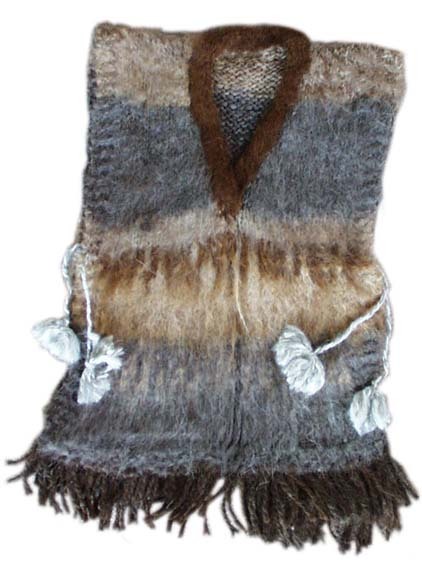 This soft, alpaca vest gives extra warmth under a poncho. It can also be worn with just a shirt when working in the fields or when wearing a poncho isn't practical. Why are clothes made from alpaca fibers good to wear in wet weather? Llamas are found throughout the Andes. Carvings of llamas are a popular craft item. 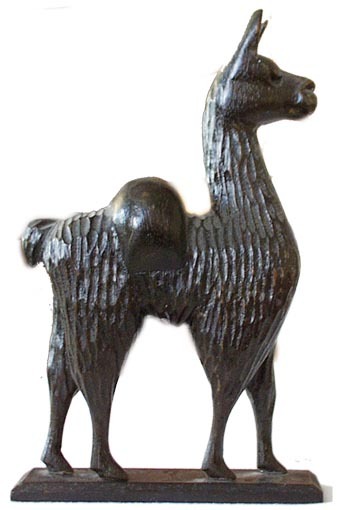 Why do people in the Andes value llamas so highly that they would take time to make carvings of them? Panpipes, also known as antaras or zamponas are a popular musical instrument. They are played by a musician forcing his or her breath across the level end of each pipe -- much in the same way a flute is played. Each pipe plays a different note. Click below to hear how panpipes sound. How could the panpipe be made differently to play higher or lower notes? 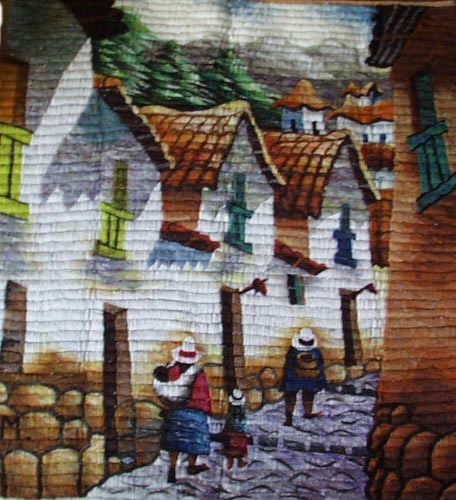 This tapestry is of a street scene in the city of Cuzco. Wide strands of yarn were woven together with thinner strands to make a "canvas." What does this scene tell you about life in traditional Cuzco? A watercolor on paper shows a common market scene. Women have come to town to sell products their families have grown and crafts they have made. How do you think the crops were brought to market?